Have you ever wanted to learn how to cook but weren’t sure where to start? Check out these amazing cooking classes in Indiana! Learn how to mix and dice, chop and slice, and finally figure out the difference between a regular knife and a paring knife. Learn how to bake at tiramisu you’ve always wanted to perfect. Here are the best cooking classes in the state. Chef Laurent grew up in Brittany, France and gained an appreciation for fine cuisine at a young age. His mother was his inspiration, teaching him how to cook and his father taught him how to appreciate the freshness of food and how to choose the best selections to cook with. His cooking classes are filled with laughter, large sized samples, great cooking tips and most of all, learning how to feel comfortable in the kitchen. Located on Evansville’s historic West Franklin Street, Thyme in the Kitchen is culinary dream that offers kitchen accessories, home accents and gifts, as well as a great variety of cooking classes. Whether you’re a seasoned pro (no pun intended) or an amateur, there are cooking classes for every skill level. Looking to book your best gal’s bridal party or for the next great corporate outing event? Give them a call! Learn how to make awesome road trip food or, if you’re gluten intolerant, learn how to make delicious and still nutritious gluten free options! If there’s one thing better than finding a great cooking class, it’s finding an institution on a mission: to end the cycle of joblessness, poverty, and hunger in their local and surrounding communities. And that’s what Cultivate Culinary does. They partner with Notre Dame University and other local food suppliers to fill the gap between potentially wasted food and the people and organizations who need it most. They teach and train those who are at-risk individuals, struggling with food insecurity, learning disabilities, poverty and homelessness, etc. They give them the skills they need and combine it with food that might otherwise go to waste. Kitchen Art: The Store for Cooks in North Central Indiana’s home for gourmet kitchenware, specialty foods, and some of the best cooking classes! Take a mini voyage through the sunny and beautiful Greek Islands with their ‘A Taste of the Greek Isles’ cooking class, or indulge in a Rhubarb Rhapsody, starring the infamous Rhubarb! Are you bored with your salad? Learn how to make a sophisticated salad and find that perfect pairing of dressing and ingredients to make your salad more exciting! Have your little ones shown an interest in cooking? Take them Sprouts Cooking School in Carmel, Indiana! The mission here is to get kids in the kitchen and teach them a love of cooking at an early age. Classes are for kids age three through 13 and combine hands-on experience with guided instruction. Your kids will learn how to measure and combine ingredients, work in a group setting, and get their imaginations working! Don’t worry! There are classes for adults and the whole family too! Did you know there is more than one specific type of olive oil? Here at The Olive Twist in northern Fort Wayne, Indiana, visitors can taste and match olive oils and aged balsamic vinegar condiments to their own personal palates. The inspiration of The Olive Twist is to help others live a healthier lifestyle without giving up the quality of flavor, something we all worry about when trying to eat healthier. Enjoy one of their popular Lunch and Learn classes, which focuses on a specific food topic and includes an appetizer, entrée and dessert. 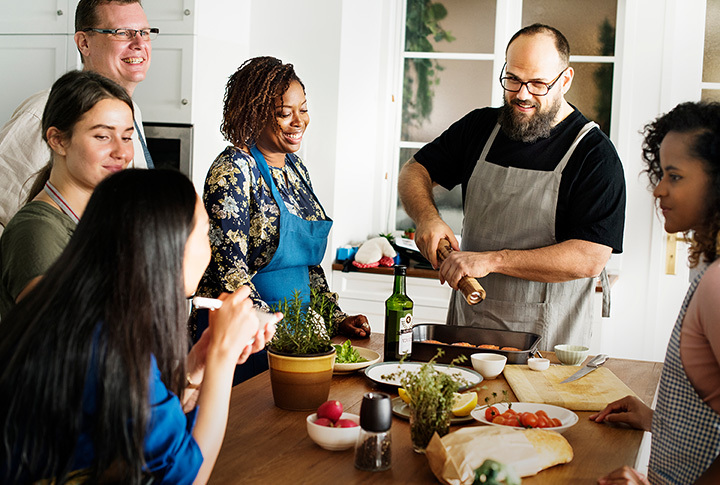 Take one of their Workshop or Cooking classes and learn a variety of cooking techniques, tips and tricks, and learn how to properly use the tools you’ll need to create that very meal. Offering cooking classes focused on technique and creating cuisine and menu items, the Bloomington Cooking School is all about creating food for personal enrichment and making it fun for all ages. Classes include Scones and Shortbread, Red Wine Primer, Fresh Pasta Perfect (who doesn’t love homemade pasta), Russian Soul Food and the Spice of Life! Each chef has a background in delicious culinary cuisines, even wine! There’s an instructor for everyone and a class for everyone here at The Bloomington Cooking School. The Nestle Inn in Indianapolis, Indiana isn’t your grandma’s average B&B. In addition to having glorious, spacious and modern rooms, they also offer some of the best cooking classes in Indianapolis. Informal and fun, each class will provide you with the necessary skills to prepare what you learn here at home. Have you ever wondered how the chefs on TV operate their knives with such precision without losing a finger? Take a Knife Skills class and learn how to handle your knife like a boss. Interested in plant based cooking? There’s a class for that too! It’s true that science and food are related, and no one knows that better than Cheryl Dornberg, owner of Mrs. Dornberg’s Culinary Experience in Highland, Indiana. Cheryl graduated with a degree in Chemical Engineering, but decided to follow her passion for food instead. Her background in engineering helps her to understand the science of food, such as reactions during cooking to interactions with the body. She believes that food and cooking can be our most powerful tool in keeping our bodies and minds healthy. When you take a class with Cheryl, you don’t just learn about the food you’re cooking, you also learn about how it affects your body, your mind, and your overall well-being with demonstrations, hands-on and specialty classes. Sur La Table recently celebrated over 45 years in the culinary industry and has been a second home to cooks ever since, helping them to find the perfect culinary tools to create that perfect meal and providing them with a knowledgeable and passionate staff for all things cooking related! But it’s not just about having the right tools at Sur La Table. In 1996, the store held its first-ever cooking class and they’ve been expanding ever since. At their Clay Terrace location in Carmel, Indiana, aspiring chefs and beginners alike can enjoy a variety of cooking classes that will teach them how to pan roast a chicken breast, make homemade pasta and the 101s of delicious fried chicken.